Steal your opponent’s General, swing with it, then Fling it to them. This card is otherwise known as a LeBron James. See Liliana Vess. Aw, man, I guess you do have to go back and know past reviews. Kills Blue and White Generals (Teferi and Cho-Manno, Revolutionary). That alone, makes this a card to be included in your Red deck. The fact that you can put it on Isochron Scepter is gravy. Picking off smaller creatures to clear the way for your own guys is pretty cool. A 4/4 for 4 in red without drawbacks (I don’t consider the Arena ability a drawback) is still pretty rare. But, if you play this with Basilisk Collar, you can kill any creature that opponent controls, gain 4 life, and if you’ve killed a small one, swing in for another 4 damage lifelinked. That’s a 12 point swing with life gain in a mono-Red deck. You’re living the High Life. A “bigger” Wildfire. It’s a known quantity, but just costs 1 mana more for 1 more damage and 1 more land scarified for all. Not saying it wouldn’t fit in a deck with Countryside Crusher, but you’re walking on thin ice with the destroying of that many lands. A Furnace of Rath on legs. Kinda. But with the drawback of it only being able to work on Sorceries and Instants is the fact that it’s yours only. That makes up for that drawback, doesn’t it? Fireball and Lightning Bolt away. Well, at least they got rid of the XY template. Still a staple. Still waiting someone to Fling their 15/15 after attacking with it. Once would be fun, the 100th time, boring. The very rare time that Red gets to have a tutor and it’s a Dragon, which makes it even more awesome. You do have to kill him to get your benefit, but it all depends on which artifact you go get in the first place. He can become a good blocker or a kamikaze attacker. Be wary of Blue players who like to bounce and White players who like to exile; if either of those two things happen, you don’t get what the dragon was hoarding. Dealing 3 damage to anywhere you want when it attacks and enters the battlefield is pretty cool. There’s that missing firebreathing that the Ancient Hellkite was missing. Played against this guy at the pre-release, and he came back to win the game after I had total control of the board. He’ll mess with math ’cause people will be like, “Oh, I can block that and the firebreathing. Oh, damn, the 3 damage.” He’ll want to attack and he will do the damage to get through. Deals 3 damage for R, and even that is fringe playable in EDH. Another one of those “Walls” that you have the upper hand. Clear the board, get it back, cast it again. Wrecks tokens decks. Equip Basilisk Collar on it and people will hate you; I know that from personal experience. I thought this had never really been printed before until I looked it up. Take your pick. This is why you do research. Wow, a red Twincast. How exciting is that? Wait, I’m actually getting word that Twincast is actually a Blue Fork. For those of your worried about the Reserved List, how can Wizards get away with this? Well, Fork actually turned the copy of the spell Red, which would make sense from a flavor perspective. Now, with Reverberate, it doesn’t, making it different enough to “reprint.” Was Wizards being sneaky? No, Red should get a spell like this, something that EDH players (like you) can abuse. Just remember, don’t Reverberate a Wrath of God, it doesn’t really do anything. Plus, do you think the art looks like Michael Jackson from the Scream video? This is going to drive people into one of two camps: really fun or really unnecessary. The people who roll their eyes over this card can leave now. A free random spell for everyone a turn? That can turn out to be really fun, can’t it? Well, it’s going to be a little dangerous to let people have their own hands and the first random card you see is a 15/15 that allows that player to take an extra turn and play another free card. May I suggest Teferi’s Puzzle Box. If you want random, I suggest going the whole way. Looks like Red got better toys than Black. But there’s only so many things you can say about “Well, this Red card deals damage.” Let’s hear you thoughts below. 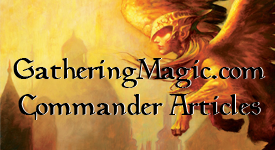 This entry was posted on Thursday, July 15th, 2010 at 12:27 pm	and posted in EDH, M11, Magic: the Gathering, Really Big EDH Review. You can follow any responses to this entry through the RSS 2.0 feed. The only time I would play Reverberate is when I need more than just Reiterate in my deck.